ICON Gate 2 and Gate 3 will open for the free event at 6 p.m. Free parking will be available in Lots 12A and 12B on the south side of TDECU Stadium. Only lower bowl seating will be available, and seating will be first-come, first serve. The Houston Team Shop will be open on the concourse with a special clearance sale set for the event. This is my first one. What’s the typical attendance? Will the two lots be enough parking? Maybe 1,000 people will show. I will be in California on business. Does anyone know if they will have the player issued clothes for sale again? +1I love the Friday night more than Saturday. Is King playing in the spring game? I will be there with my brother. Wish we could get 5k there ar least! This is probably the longest UH basketball has ever held my attention, so I am just now turning my attention to football. Can’t wait to see what this team will look like this year. Is this the Spring game essentially? I do not remember this event last year. Yes, it’s the spring game. They used to call it the Red and White game, but are apparently going with Friday Night Lights this year. I was initially confused too. 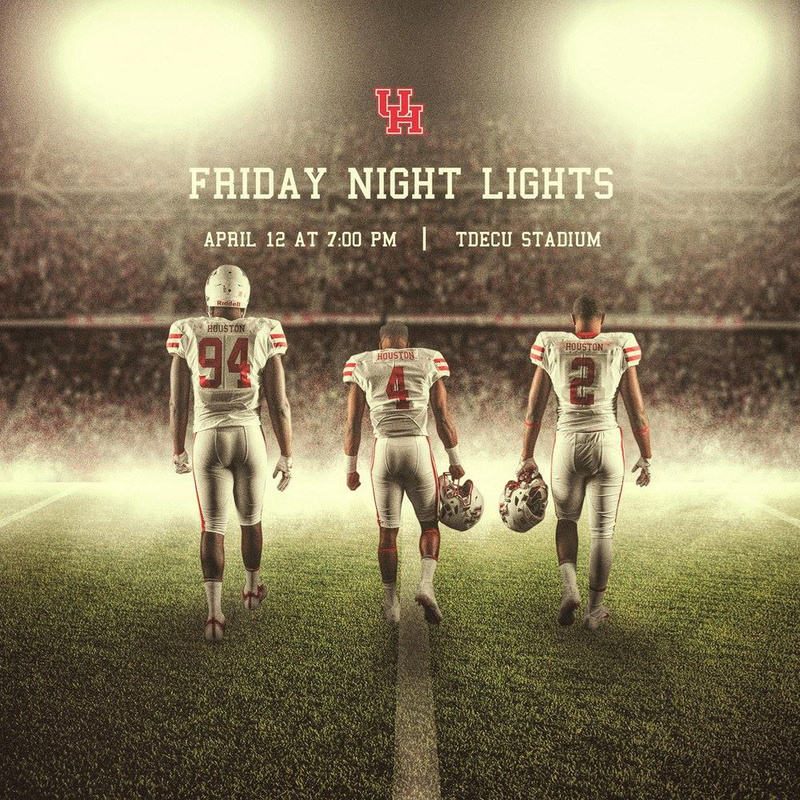 Does anyone have more info on Friday Night Lights? I want to go to the scrimmage but don’t really care about the rest. Is there a schedule somewhere? For those who have asked @UHCougarFB Friday Night Lights event this week is serving in place of spring game. There will be a scrimmage portion but not traditional spring game as in years past. The flyer posted on the website doesn’t have any information. Update: I can literally feel the marketing department cringing. I was planning to round up some buddies to go watch this, but if it’s just a practice, I probably won’t. Disappointing, from a fan’s perspective. These are the fans the University wants to buy season tickets, and we get “come see the practice, if you know what is going on”. Sorry, I am disappointed. Not spending my time for this. And yes, I have my 8 season tickets already purchased for next season, so I can be disappointed with this public relations gaffe. What a bunch of whiney comments. I don’t recall a true spring game at UH in the past 40 years and I’ve attended many - if not most - of the spring scrimmages. I’m not trying to be whiney. I’m legitimately trying to figure out what this will be. So far there has been almost no information about what to expect other than “a scrimmage component” and a clearance sale on merch (most likely bowl game t-shirts from last year). Last year was the only spring game I’ve ever been to, so I don’t have much to compare. Other than being really cold, it was fun because we got to see a whole bunch of guys play and start getting familiar with names and numbers. But I really don’t want to drive out there, much less round up non-UH buddies to go with me, to go watch our guys run drills.